Johann Philipp Guichard and a town syndicate owned the Magdeburg faience factory, which was founded in 1754 with the production of faience tiles. Two years later they bought three houses in Magdeburg in order to increase the faience production. 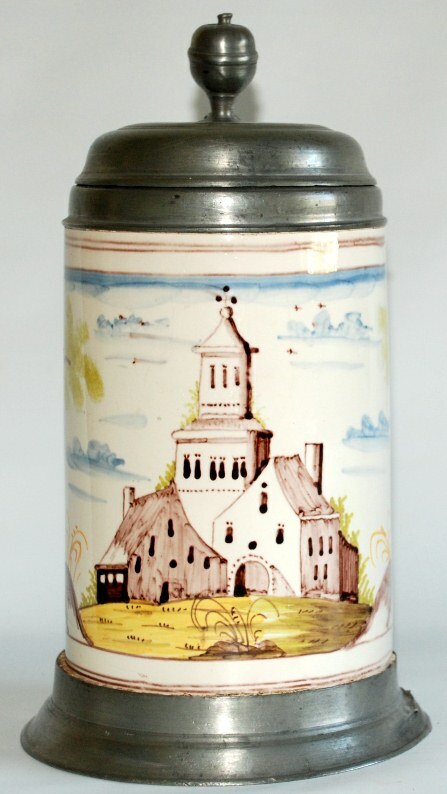 It wasn’t until 1764 that Guichard received the privilege for this faience factory. This privilege was extended 10 years in 1779. 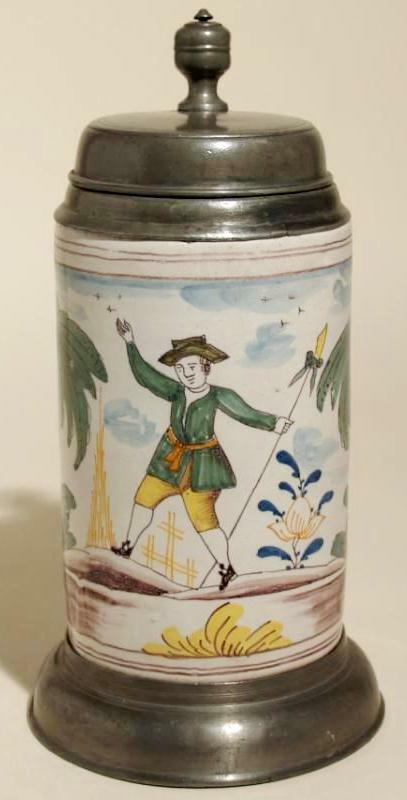 No further extensions were granted in 1789 and it is believed faience production ended in 1785 or shortly after. Guichard received a privilege to make stoneware that year. 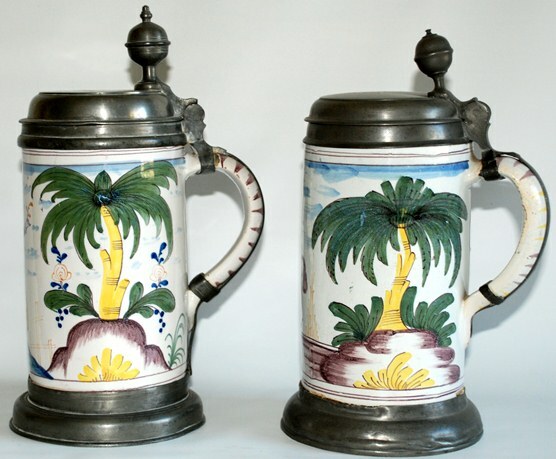 The Magdeburg factory, which was located in central Germany near Berlin and Potsdam, is unique in that they made two different types of steins. 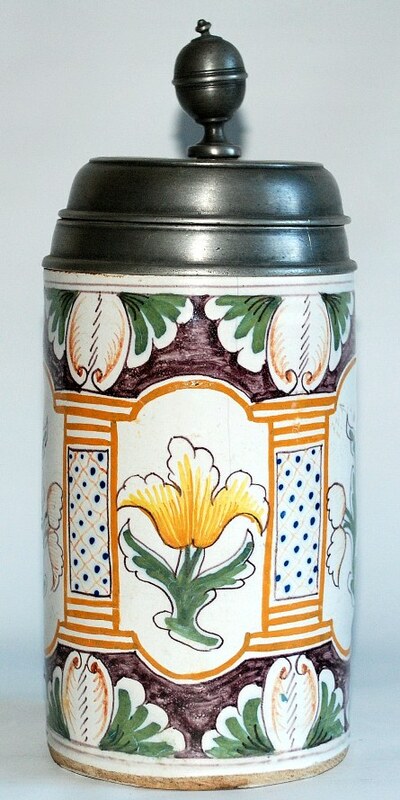 They made typical faience with opaque white tin oxide glaze and creamware that is a transparent lead glaze allowing the natural clay color to come through. 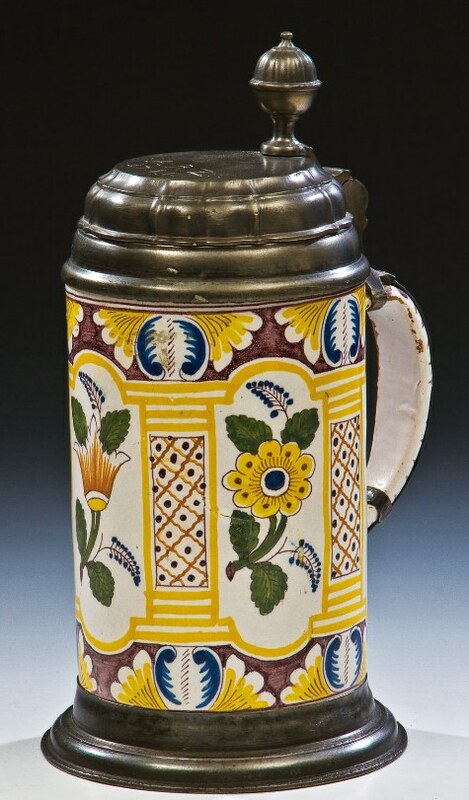 In reviewing all of the Magdeburg steins that have sold in auctions through the last 20 years, one can find the creamware pieces as often as their faience counterparts. Figure 1 shows the typical Magdeburg white faience stein while figure 2 shows their creamware version. We hope this article and the many photos will help educate the collector with enough information to recognize pieces from this factory and their two different stein bodies. The decoration on the white faience steins is very crisp. The paintings are in manganese, yellow, green, and blue with both a dark and light shade of each color being used. The scene is centered on the front of the stein and usually there are trees on both sides of the stein. Blue clouds are painted in the background, often with flying birds. 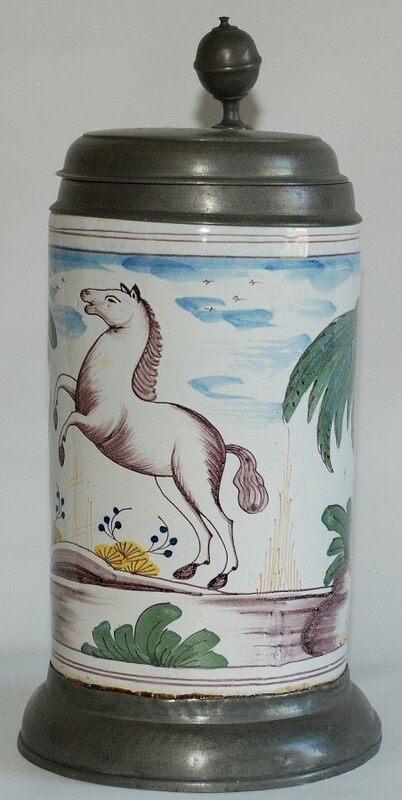 Figures 3 & 4 show two faience steins one with a Chinese scene and other of a horse. 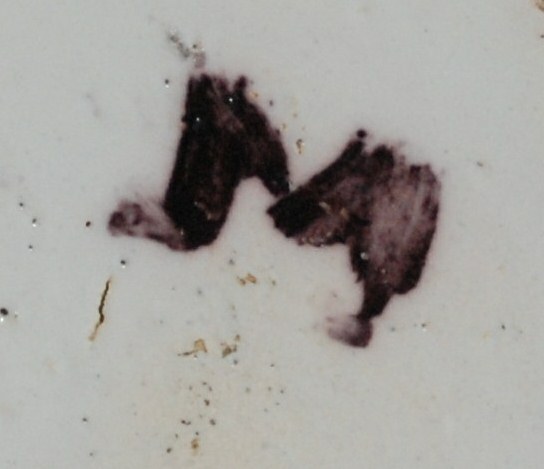 The gold/orange decoration to the left of the Asian character in figure 3 (looks like a tower) is typical on many Magdeburg pieces and can be seen to the right of the horse in figure 4. 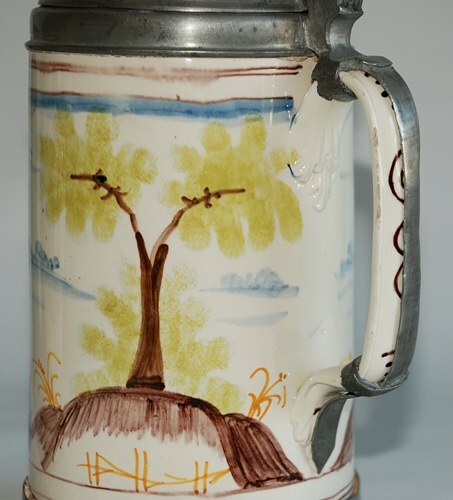 Unique to the white glazed steins is the fact that the trees that appear on each side of the steins are (almost) always palm trees (figure 5). The only exception is floral steins where the floral decoration wraps around the entire body. On architectural, stag, and horse themes the main scene is usually painted in a manganese color. Also, note the yellow mounds with blue flowers, again typical for these pieces. 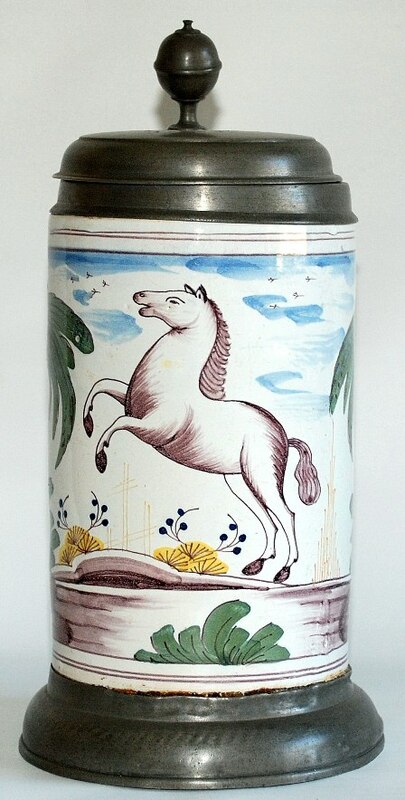 Horse scenes which have been found on nine steins from various auctions all look the same, and thus can be used to identify a Magdeburg piece. The most frequent scenes on the white faience are figural, horses, floral, and architectural, in descending order of frequency. There is only one style of handle used on the faience bodies. It is a heavy, thick, free form handle tapering from top to bottom with the a side view of the handle in the shape of a D. This handle is flat on the inside and rounded on the outside (figure 5). The pewter lid usually has a top rim lip ring and the base is a straight side full pewter base with the bottom of the stein usually completely covered with pewter. 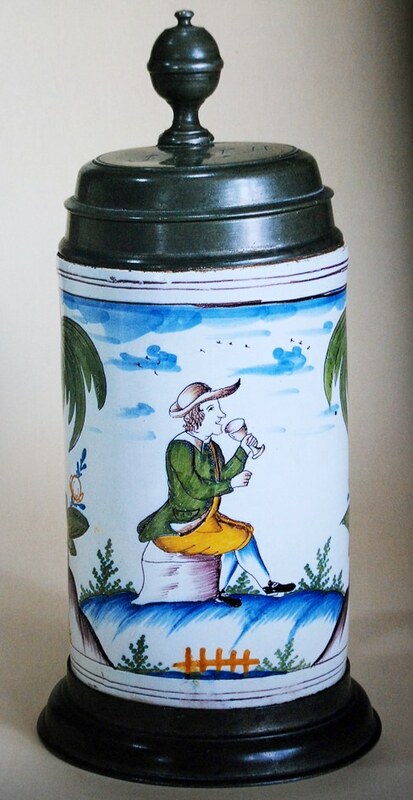 Up until the mid 1990’s, the faience type steins that have an ivory colored glaze were called creamware by many auction houses and were not identified as Magdeburg pieces. As I have mentioned in the first paragraph of this article, the Magdeburg factory was granted a privilege to manufacture stoneware in 1785. Even though these creamware steins do not make us think of stoneware as we know it. It was in fact fine stoneware (steinzeug) and greatly differed from their faience line. Pottery had been thrown and made on a potters wheel for centuries. The shape and size of a piece was determined by the manipulation and talent of the potter. The English potters discovered that if they liquified the clay, they could pour it into plaster molds containing the desired shape and size of the piece they were looking to create. This allowed the pottery industry a way of mass producing an item using normal workers with little to no experience. The discovery changed the ceramic industry forever. the ivory glazed pieces are figural, stags, and architectural, in descending order of frequency. 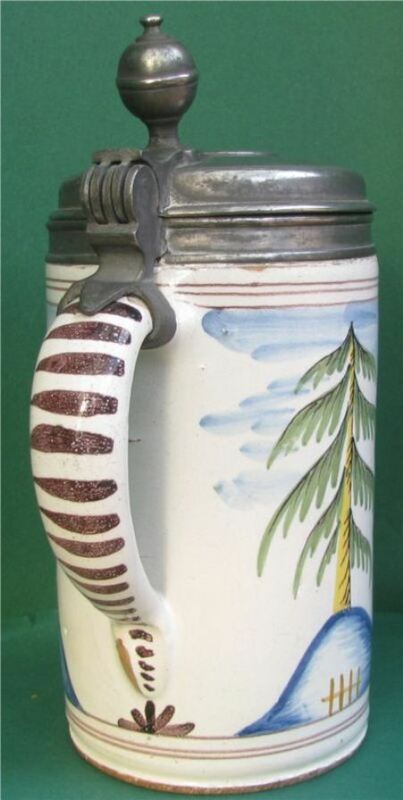 The creamware steins have two types of handles. The first design was mostly free-formed with no tapering from top to bottom. The side view again is in the shape of a D, being flat on the inside and a rounded on the outside. The bottom handle attachment has a molded leaf type design. This handle design is seldom found as it was only used at the beginning of their new production and quickly gave way to the more commonly found design (figure 10). 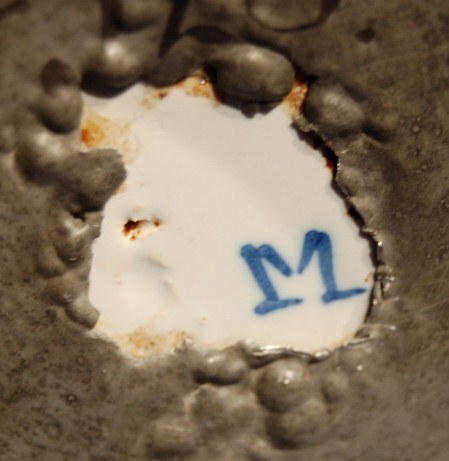 The second design found on creamware pieces was a completely molded handle. 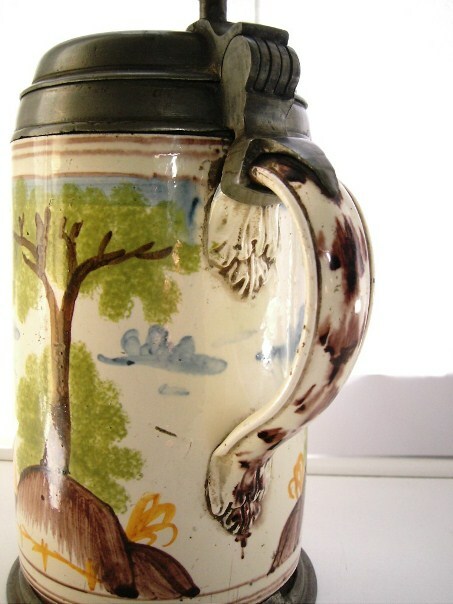 The top and bottom attachments used the same leaf design, which was applied to the stein body, and is the same design that was used in the bottom attachment of the earlier handle design just mentioned. The handle has a thin cross section with a molded edge on both sides and has no tapering from top to bottom. This handle is shown in figures 11 & 12. 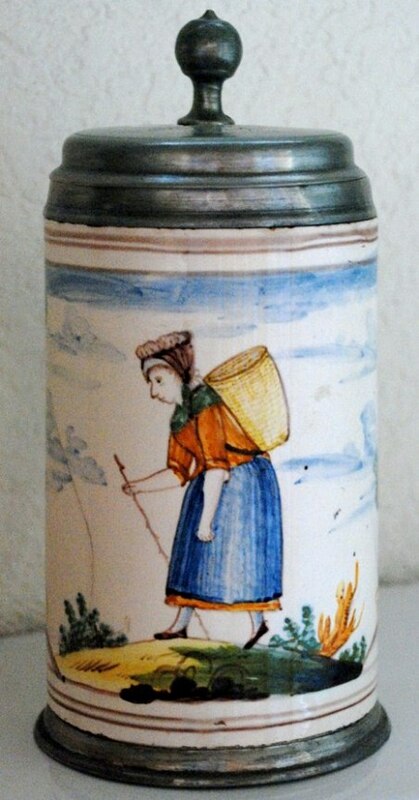 I Believe that the handle design progressed as the factory refined their manufacturing techniques and can be used to help date the steins from early in the production cycle to later. The faience handles will never be found with their later creamware molded design and it is fair to say they fall into the 1764-1785 production era. The earlier creamware molded handle is a combination of the older faience free form handle with a molded lower attachment. This handle helps to tie the white faience and creamware pieces together as being manufactured by the same factory. 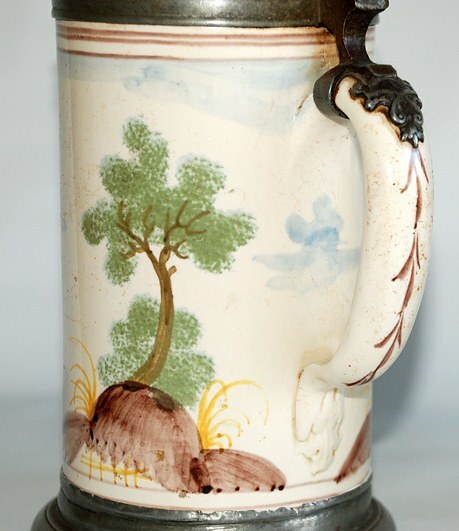 It is safe to assume steins with this handle type fall close close to the 1785 production period. The later all molded handle shows more sophistication in its manufacturing and attachment methods. 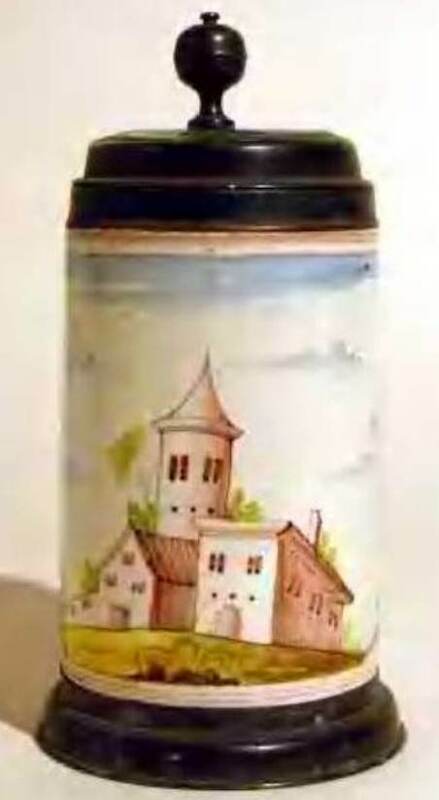 This handle is found on the majority of Magdeburg Creamware colored steins from 1785 on. 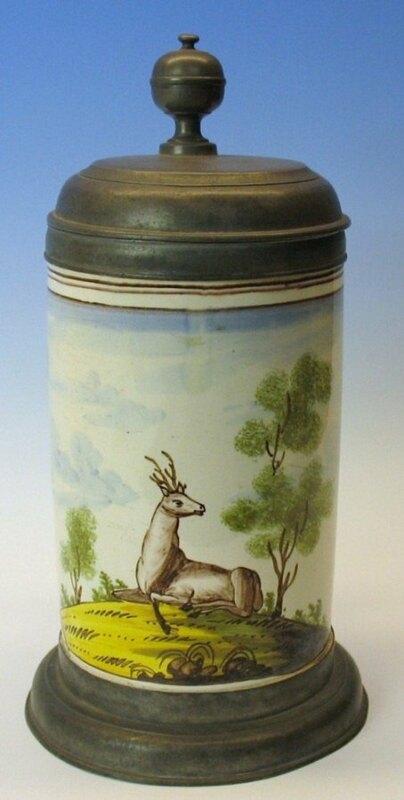 It is fair to conclude that Magdeburg’s stoneware creamware production continued into the early 1800’s. 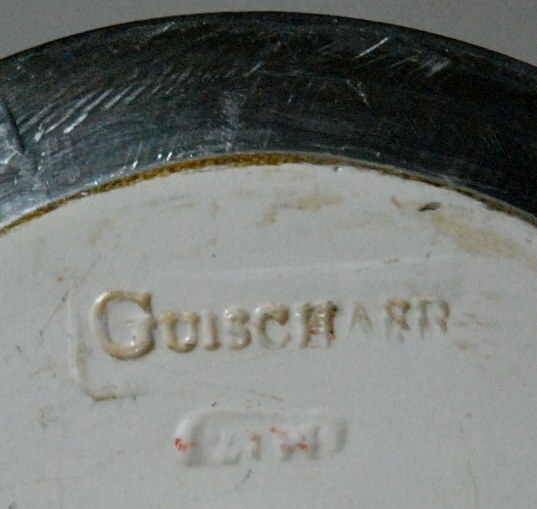 I do not know if the typical M mark as shown previously in Figure 6 TO 9 appears on the creamware steins, but only on the creamware pieces, you sometimes find the name Guichard stamped in the bottom. Since first writing this article in the September 2006 issue of PROSIT, I have found several more marks for the creamware steins. 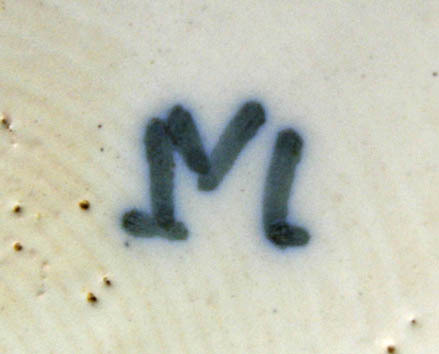 First is the block style M similar to the faience pieces and this is shown in figure 17. Also note that the bottom of the creamware stein is completely glazed. 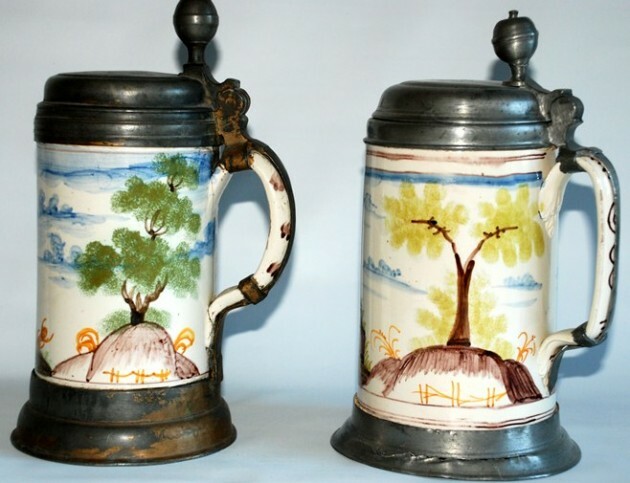 Special thanks are given to Johannes Vogt who supplied me with numerous photos of the Magdeburg steins that appeared in his auctions over the past several years. He supplied photos of the side scenes in additional to photographing all the handles on the steins. 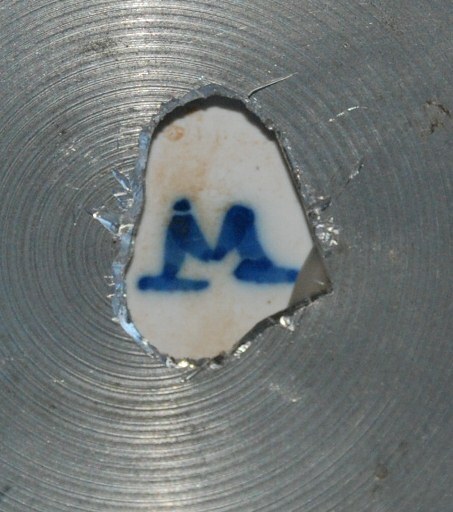 This information helped me verify my theories on Magdeburg faience pieces. Below are additional Magdeburg stein photos from Bill Hamer, that were not used in the PROSIT article. I only drink to make other people more interesting!